It is the 32nd year for this fabulous annual fair! Come and enjoy 100 crafters and fiber artists, music, and demonstrations of sheepshearing and herding dogs! Sheep-shearing, herding dogs, spinning, weaving, and more. Large crafts fair, live entertainment, wagon rides, historic demonstrators, games and farm animals. Food vendors, no dogs allowed, children must be accompanied by an adult. Now in its 32nd year, this outdoor, farm festival has become a family favorite and a tradition throughout the region! 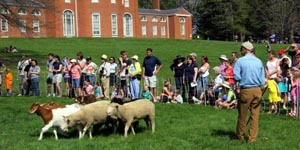 Enjoy demonstrations of sheep-shearing, herding dogs, spinning, weaving and gardening on a beautiful 50 acre estate. Our festival features both traditional manual blade sheep shearing and electric sheep shearing. Sheep fleeces are collected and later sold. Our Leicester Longwool sheep are sheared the traditional way and other sheep are brought in for the electric shearing. Our crafter area has 75 booths with artisans selling handmade candles, birdhouses, jewelry, metalwork, pottery, and more! Large crafts fair, live entertainment, historic demonstrators, games and farm animals. Wagon rides and museum tours (additional charge). No dogs or other pets allowed. $20 adults. Children 12 and under free. Children must be accompanied by an adult. Gore Place is located at 52 Gore Street in Waltham, Massachusetts just off Route 20. From I-90 (Mass Pike) take exit 17 to Watertown Square. Turn left onto Route 20 (Main Street). Travel 1~1/4 miles to Gore Street. From Route 128/I-95 exit 26 to Route 20 east (Main Street) 3~1/2 miles to Gore Street.